This plant is only found in localised colonies in southern Britain and Ireland. 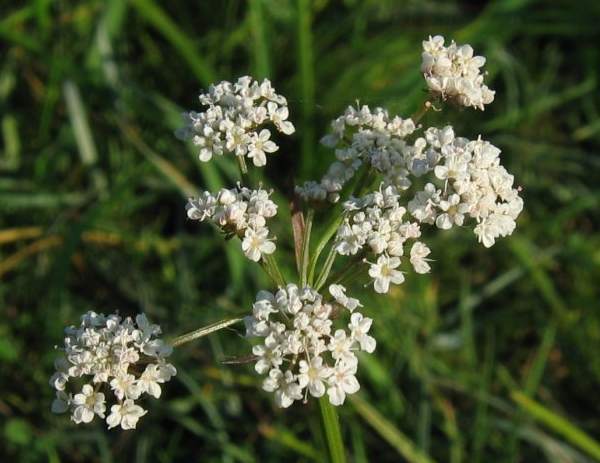 This perennial plant grows mainly in salt marshes, where it is a summer blooming umbellifer, although it does also occur inland in damp grassland and marshy areas. 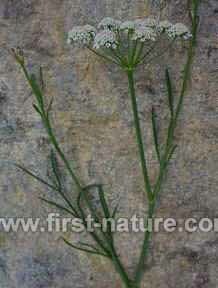 It has narrow pinnate leaves and white flowers, sometimes with a tinge of pink, arranged in compound umbels with conspicuous bracts. Parsley water-dropwort, also referred to as Water Parsley, typically grows to 80 cm in height, but in exposed coastal areas the wind often restricts it to less than half that height. The narrow, sparse leaves are a useful identifying feature. The pictures on this page were taken in West Wales in June.